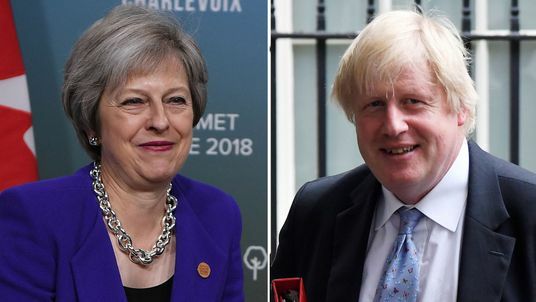 Theresa May has dismissed leaked audio recordings of a speech by Boris Johnson in which he openly criticised her handling of Brexit. Asked whether she expected an apology from the foreign secretary for undermining her position, the prime minister said: "The foreign secretary has strong views on Brexit, but so do I. That's why I'm getting on with delivering Brexit." Speaking to Sky News at the G7 summit in Canada, Mrs May dodged a question about whether Mr Johnson had become "unsackable", but hit back at his assertion that the Irish border issue was "a folly" and that the "tail was wagging the dog". "The issue of the border between Northern Ireland and Ireland is very important to the United Kingdom," she said. "I have been very clear, and the government is very clear, that we want to ensure there is no hard border between Northern Ireland and Ireland, that is an important border for the people who live both sides of it."